Today in the midst of hundreds of multi specialty hospitals in Bangalore city Apollo Hospital unarguably & proudly stands tall. Deservedly so as Apollo Hospital in Bangalore has been providing immaculate medical & health service to patients from across the world since its inception in 2007. What is even more worth praising is that immaculate medical service is provided at very affordable cost, making it possible for people from every walk of life to avail world class medical facilities. 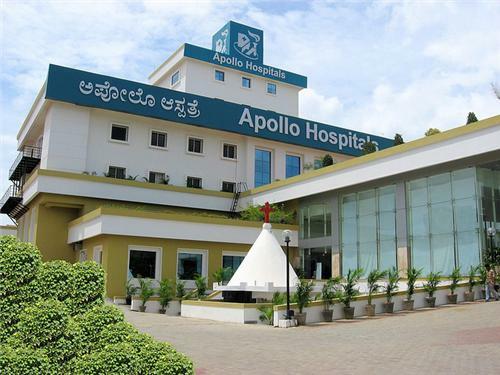 Apollo Hospital in Bangalore was 42nd hospital of Apollo Hospital Group, which has already earn immense faith & trust in medical fraternity with its dedicated super specialty hospitals across the world. The Hospital is located in the famous Bannerghatta Road of South Bangalore. It’s a six storey building that boosts cutting edge & state-of-the-art medical technology. However more than cutting edge technology it is personal touch & love showered by doctors and medical staff that has helped Apollo Hospital Bangalore earned credible reputation in such short span of time. All the doctors working in Apollo Hospital are handpicked amongst the best, with proven track record & high pedigree of skills. Today Apollo Hospital Bangalore provides excellent medical solutions in Orthopaedics, Neuro Sciences, Cancer, Cardiac Sciences, and 36 other medical problems under one roof. Apollo Hospital’s 6 storey building also has special departments dedicated to arrays of medical problems, ranging from Eye Care & Anesthesia to Surgical and Cosmetology. Holmium Laser First hospital to use this technology in entire South India. Thallium Laser-First hospital to use this technology in entire India. Digital X-Ray First hospital to use this technology in Karnataka state. Low energy & High energy Linear Accelerators. 4-D Ultrasound for 4 dimensional Sonography. Heart institute holds the rare distinction of doing most number of heart surgeries in entire South India. Orthopaedics holds 99% success rate for Hip Resurfacing procedure & also specializes in complete Knee Replacement in entire India. Broadband as well as wifi internet facilities. Special laundry facilities for patients. STD & ISD telephones are provided at patient rooms. Translators or Interpreters for various languages. Famous Cafe Coffee Day restaurant is located within the hospital. Hospital Information: (080) 26304050 / 51.